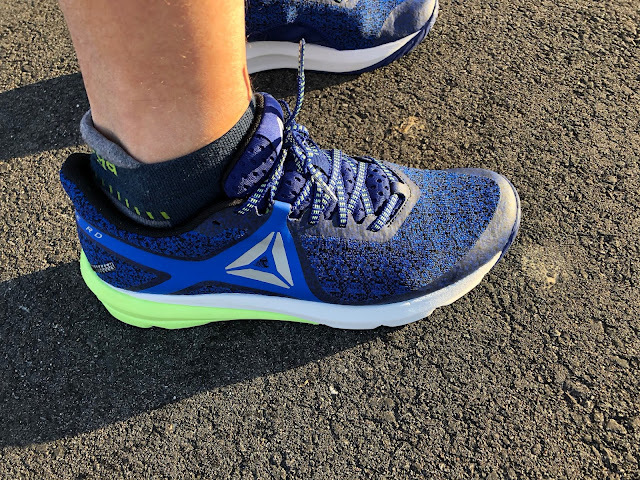 Road Trail Run: Reebok OSR Grasse Road Review: Heavy Duty, Stable, Super Cushioned Daily Trainer..Without the Heavy Part! Reebok OSR Grasse Road Review: Heavy Duty, Stable, Super Cushioned Daily Trainer..Without the Heavy Part! 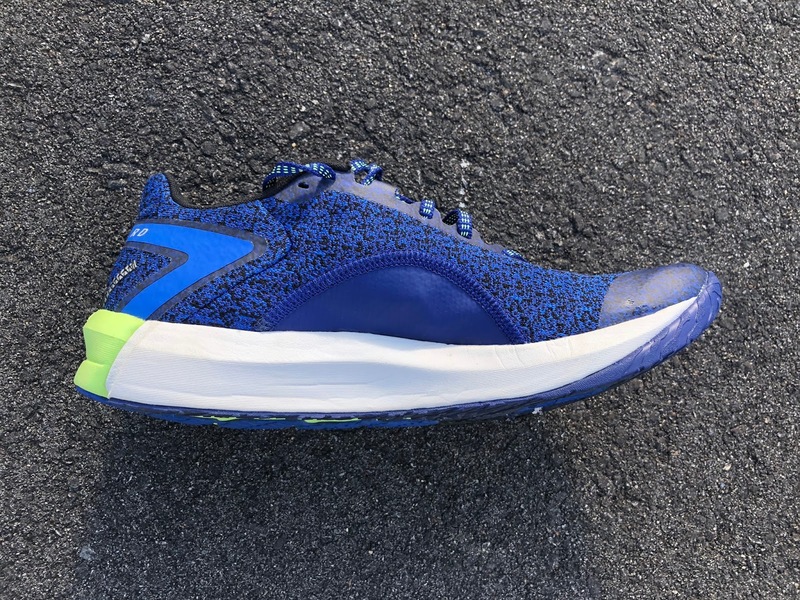 Reebok surprises again with the Grasse Road, a light 9.8 oz max cushioned neutral trainer with steady stable manners bordering on that of stability shoe at the heel and with some livelier neutral shoe personality and transition further forward. Grasse Road has a substantial 30mm heel, 24mm forefoot stack, a just right for me 6mm offset, some rocker to the front midsole with also decent flexibility for such a massive stack, and copious coverage of thinner but still substantial firmer rubber. It is priced at $130. 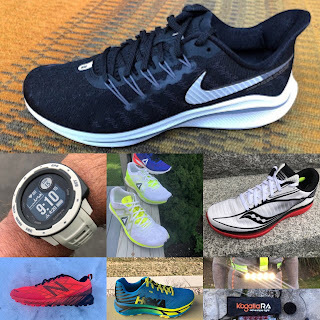 Grasse Road is clearly is intended to compete with the similar weight and stack Clifton 4, somewhat less cushioned Nike Pegasus, well as considerably heavier "premium" type daily trainers such as the Fresh Foam 1080, Saucony Triumph ISO, Asics Gel-Nimbus, and Nike Zoom Vomero. The Grasse Road and shoes in the OSR series are all named after famous running routes. They picked well with this name as Grasse Road in Hanover,New Hampshire is a route I ran many times in college at Dartmouth, starting as a dirt road climbing alongside a stream, running past the end of reservoir then ending at the top of the very steep and infamous East Wheelock Street. If I was to characterize the Grasse Road I would say it is a shoe for pounding down steep roads such as Grasse Road in complete stability and comfort while having enough lively flex to make it back up the hill. 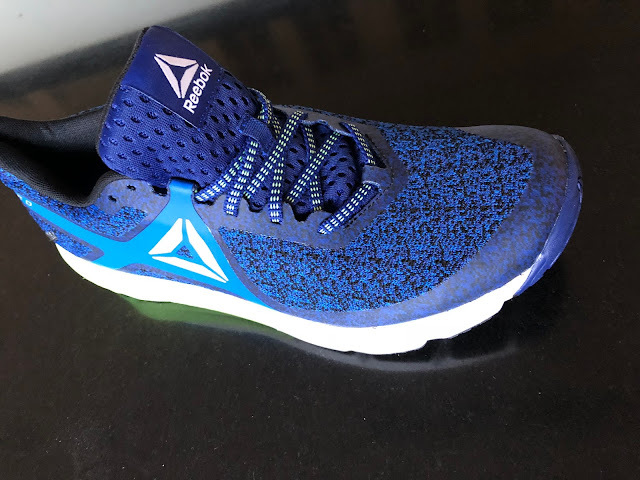 In 2017-2018 Reebok has re emerged from many years as "cross training" brand as a serious run shoe contender with several new shoes based on Peba foams similar to those found in the Nike VaporFly. See our review of the Floatride series here. The Grasse Road uses mostly EVA but has some midsole tricks up its sleeve, or more accurately heel. As with all such engineered knit uppers the fit was somewhat snug at first but loosened up some. The toe height is a bit low but not an issue. The fit is supportive and smooth all over. I am true to size here. The look is serious and spare with minimal thin overlays but a touch of color from the rear lateral tri density midsole foam. 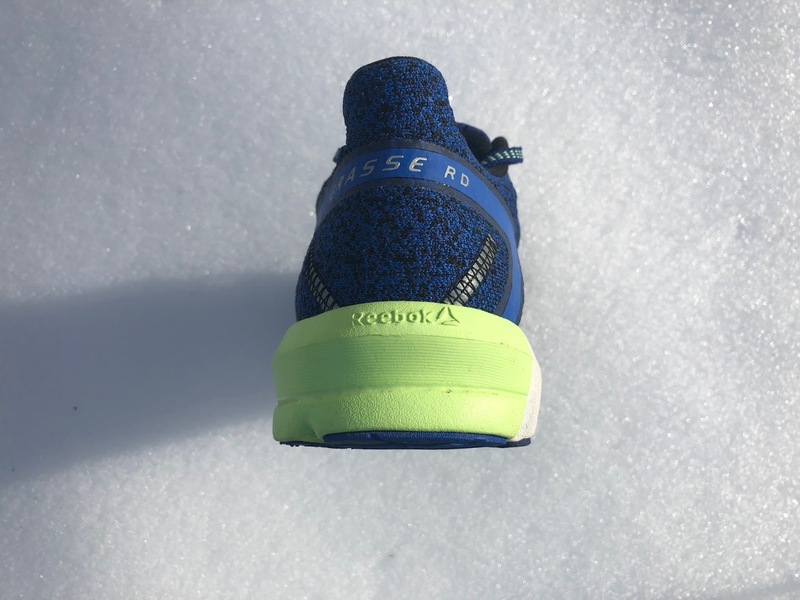 Grasse Road's upper is a single piece entirely seamless knit which Reebok calls SmoothFuse. It is quite dense but relatively soft, light and stretchy so breathability should be decent for such an upper. It is certainly foot conforming. and an inserted non stretch panel on the medial side, a clever way to support the arch in a knit upper. Inside we have a soft leatherette yellow underlay. 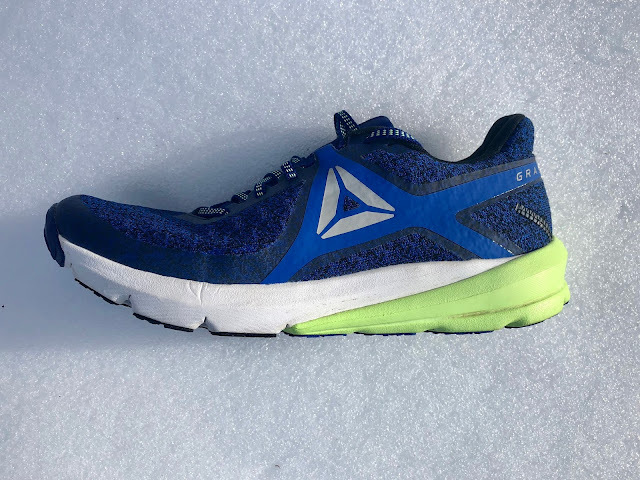 It reminds of the Pro-Lock strap in the Kinvara but here it is a softer material and is laminated to the outer knit upper instead of free floating. 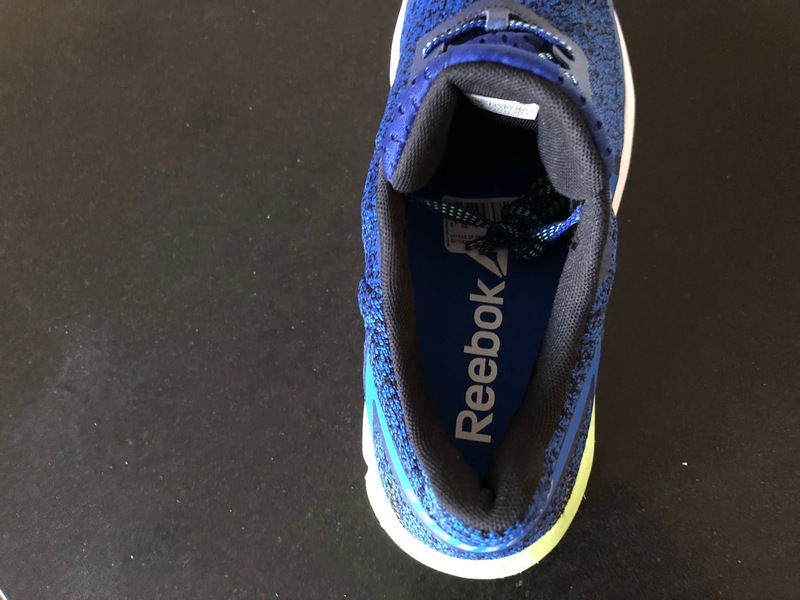 It tapers to connect with the second lace loop so there is no sense of a protruding plastic piece over the foot. I did not feel it at all and only noticed it when I examined the shoe more closely. Finally the shoe has a bootie construction with a stretch panel running the entire length of the tongue and then some as it extends back towards the heel all the way to the last lace hole. Usually booties are shorter but here Reebok seems have to have wanted to be sure that the foot was fully locked down mid foot to heel,and it certainly is, and especially so for a knit upper. This is a different approach than taken in the Floatride Run which awkwardly resorts to a plastic lattice cage to hold things together with a stretchier knit upper where tongue and upper are one. I am not a fan of these entirely one piece stretchy knit uppers for just that reason; it's hard to lock down the mid foot. They are either overly snug or have to resort to cages and other tricks. In the Grasse Road the entire system of mid foot support works very effectively and there are no constricting spots or loose, sloppy areas. The tongue is relatively puffy and soft. The ankle collar and achilles collar are moderately padded. The toe bumper is a soft overlay and in combination with the knit upper is relatively low. I think a stiffer toe bumper with less coverage over the big toe might raise the knit a bit better. While not a super wide shoe the fact there are no overlays at the metatarsals and the knit has some give should make it worth trying for wider feet. While visually simple in design with no extraneous "sculpting" the tri-density midsole is quite complex. The lime green foam on the lateral side is softer than the white foam. Neither is a super firm foam but they aren't super soft either. The firmer white foam extends the entire length of the medial side for more support. In the center core at the heel we find a very unusual, unique in my experience, insert of steam molded tubes of TPU called KooshRide foam. 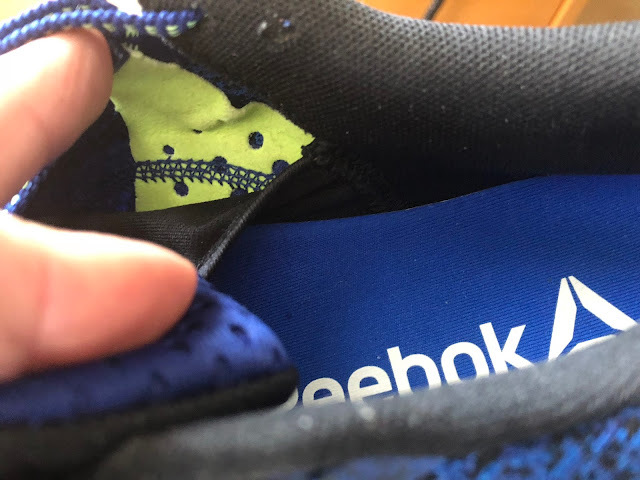 Reebok says KooshRide absorbs shock forces and is longer lasting than EVA in this area. Landings are a very cushioned, on firm side, stable and largely shock free, a super steady and stable feel that is for sure. The deep central cored out area, longitudinal decoupling line and deep flex grooves provides a decently smooth transition for this big shoe with a combination of a nice single forward flex point and the front rocker moving things along very well on toe off for such a big stack. The geometry at mid foot is relatively carved out and curved, so a neutral kind of transition. Overall the platform is on the narrow side for such a big stack shoe and the stability provided. This narrower platform likely also contributes to the low weight for such a big shoe. Again a clever design decision. 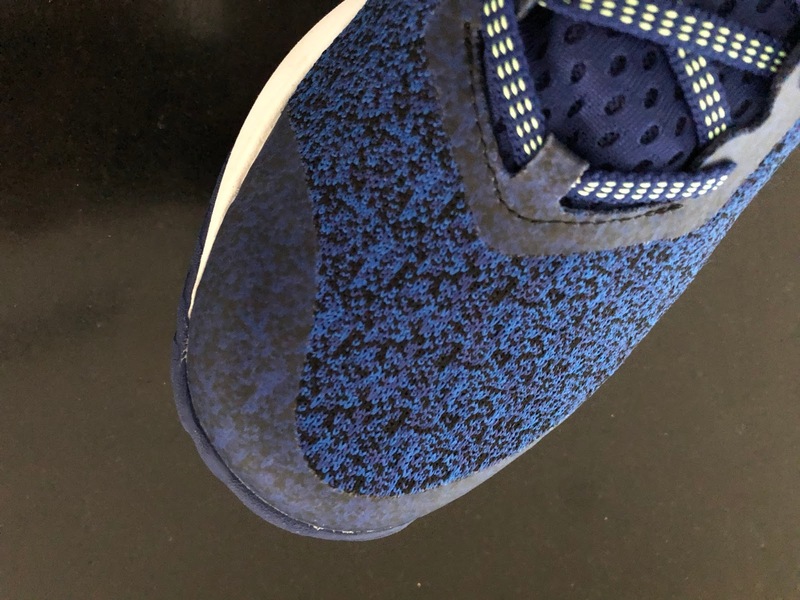 The medial side midsole of firmer white foam, but not posting firm foam, and the bowing out of the midsole walls just in front of the heel heel definitely give the rear of the shoe some early stage pronation control without ever being of the overwhelming ouch there is a stability element here sort. It just feels a bit wider just in front of the heel on landing. 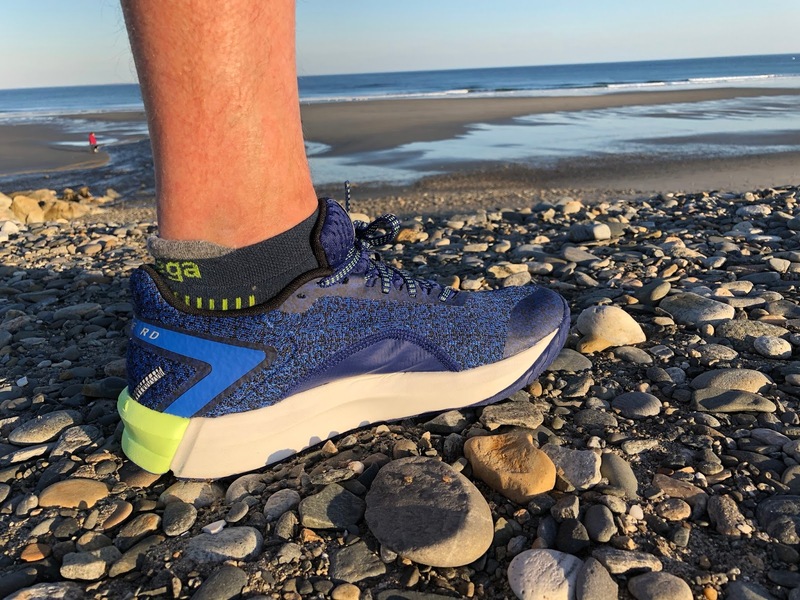 The extra width is gently felt then as the gait moves on we have a neutral type shoe transition and push off yet one well supported without being plate like or made harsh by the substantial (but for my tastes to substantial) outsole coverage. The outsole coverage is extensive. The rubber is on the thin side and firm and appears to be all of a single density. There is no slapping and no harsh feel where outsole meets road likely due to all the foam above and the outsole's relative thinness. Upfront at the first metatarsal Reebok includes what it calls its PwrPad and PwrZone technology to improve response at toe off. Not sure I could really feel it but toe off is fine if a bit overly supported. I question the necessity of all this continuous rubber particularly on the medial side. I would like to see some flex grooves on the left medial side behind the PwrPad to extend the flex somewhat. The outsole extends higher up the sides up front on the medial side than the lateral. I assume this is for toe off wear and part of the PwrZone but I might prefer less outsole there to ease toe off. It took a couple of runs for the shoe to flex well at its single flex point. Not that it is very stiff but all that outsole rubber coverage was getting in the way. The cushioning is substantial and stable. Softness is moderately firm, firmer than say a Brooks Glycerin or adidas Energy Boost and softer than a New Balance Fresh Foam 1080 and about the same as a Saucony Triumph, understanding the Triumph has thicker outsole rubber muting its Everun softness somewhat. The transitions are relatively smooth but I do think there could be more front flex grooves and less medial side curved up outsole. Despite the light weight, but given the big stack, relatively short flex, support, and inherent stability the Grasse Road runs best for me a moderate to slow paces. This said it can pick up the pace if pushed. The Grasse Road is solid, super well cushioned and comfortable daily trainer with a lot of substance top to bottom at a sub 10 oz weight, which is pretty amazing if you think we have a 30mm heel and 24 mm forefoot stack here and all the rubber outsole. This combination makes it a great long run, big miles shoe for those seeking some inherent stability in a neutral shoe. I have mainly used as a recovery and easy run shoe when everything is sore but I want some support and stability. 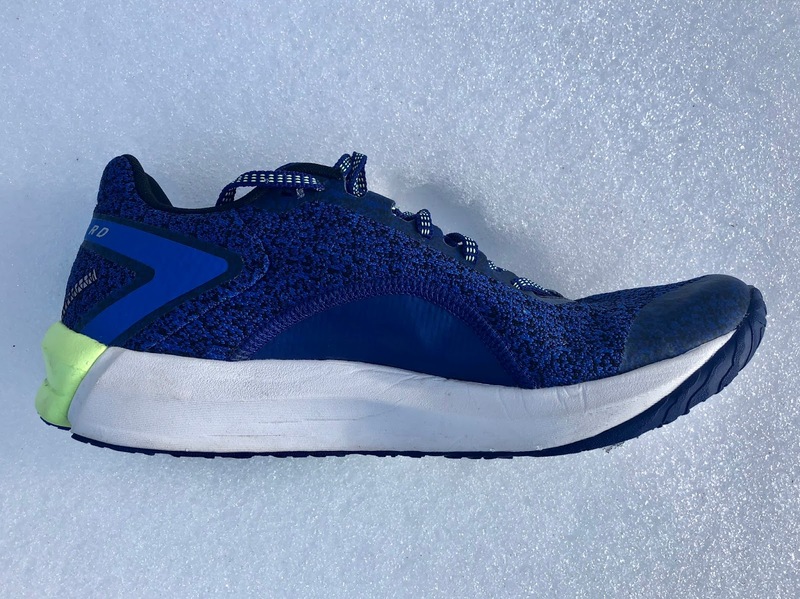 As such I prefer it to premium type and more premium priced trainers such as Nimbus, Triumph, Energy Boost, and Glycerin where the added weight is certainly felt and the overall ride is more labored than this smooth if somewhat lumbering operator. The inherent stability from the supportive upper, tri-density midsole and the medial flaring of the midsole could make it a good choice for those preferring some lighter, more unobtrusive stability in a trainer. 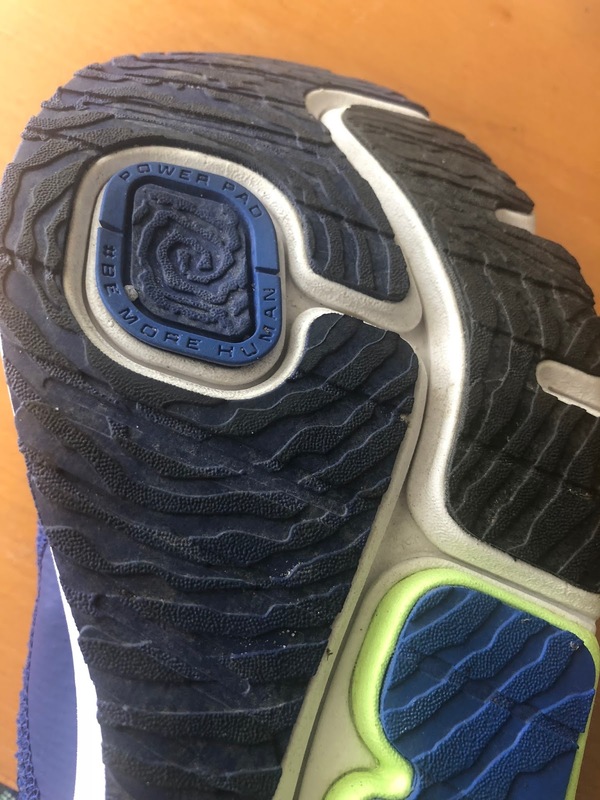 I personally wish the flare was removed as there is plenty of stability otherwise here., The somewhat lighter lower stack and lower outsole coverage but similar OSR Sweet Road would be more to my tastes as a daily trainer. 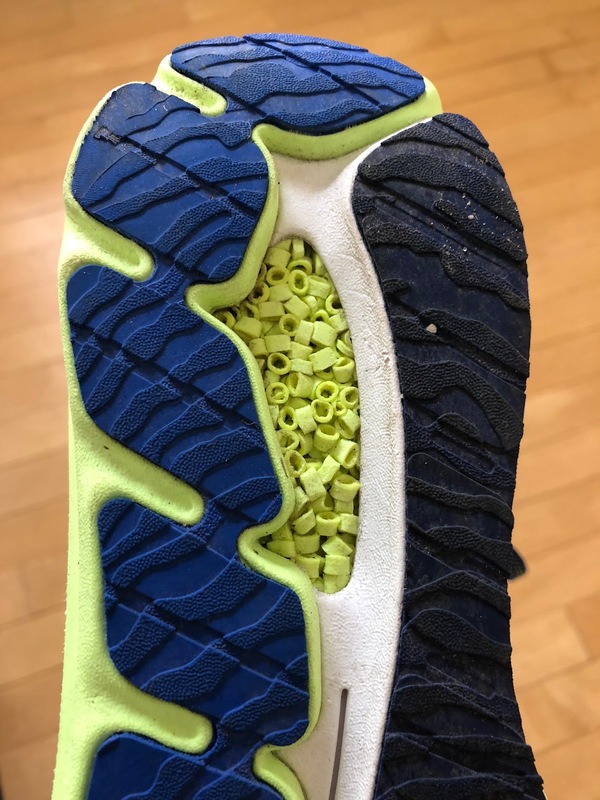 -1 for overdone outsole rubber especially upfront and lack of a few more medial flex grooves, impeding toe off somewhat at faster paces. I struggled to move along in this light shoe. -0.25 for somewhat low volume over the front of the toes. A firmer more vertical toe bumper high help. -0.25 for the medial midsole flare which is ever so slightly in the way of my gait. 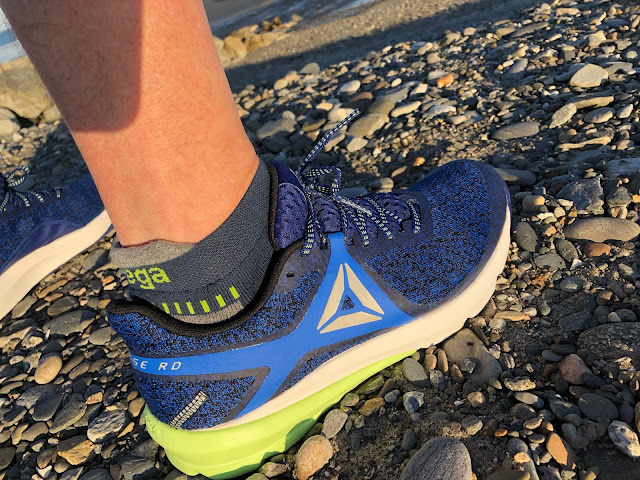 The Ultra Road is about an ounce lighter and has yet more cushion stack. It's upper is superb. 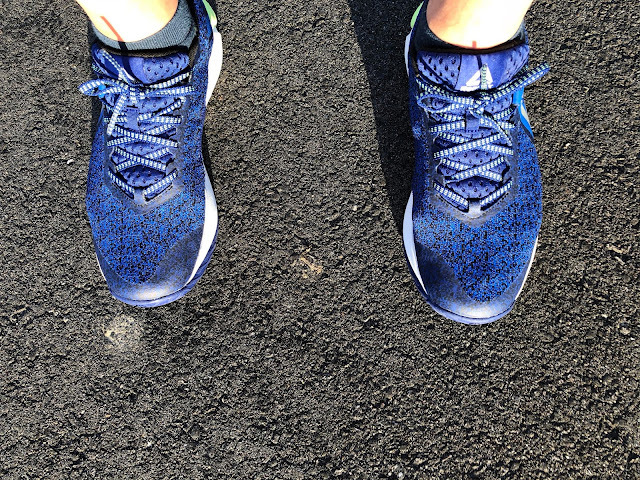 It is a faster more lively shoe but you will get more stability and support and more miles out of the Grasse Road. I would give my personal nod to the Skechers. Considerably softer and have an ounce lighter the Clifton is livelier, bouncier and far less stable, especially at the heel. It also has less outsole coverage. It comes down to preferences and needs. If you are a neutral runner with no need for any kind of stability go with the Clifton. It is more fun but harder to tame. If you want a steadier high mileage trainer with some inherent stability and one you likely will get more miles out of go with with Grasse Road. I have never been a huge fan of Clifton's soft unstable heel, although improved in the 4, despite the lively ride, so if I could only pick between these two for a daily trainer I would pick the Grasse Road but would not race or do uptempo in them preferring the Clifton. While I have not run in the Bondi recently I think Grasse Road would measure up very favorably and likely would be my choice over the Bondi as it is considerably lighter, more flexible and while not as maximally cushioned more "reasonable" overall as a daily trainer. The Triumph is way heavier at over 11 oz vs. under 10 oz. for the Grasse Road. I am not convinced the heavy Everun TPU full midsole is worth the extra weight. Reebok used the "noodle" like Koosh Foam TPU insert to get many of same benefits in Grasse Road at the rear of the shoe. The Grasse Road upper fits me somewhat better. Despite all that extra weight, the Saucony more than holds its own with a smoother transition and so far a better run feel at faster paces as I think overall its outsole configuration in the forefoot is superior in transitions. While weight isn't everything, I do feel the extra weight of the Triumph so will give a slight nod to Grasse Road. The HOVR weighs somewhat more with somewhat less stack height, especially at forefoot. It shares a soft heel to mid foot insert concept with the Grasse Road. It also has a very stable heel due to its firm outer carrier form and a very substantial round shape heel outsole. It is firmer than Grasse Road but almost as stable. Its upper is superior in fit, one of the best of 2018 and surely more breathable. I prefer the HOVR for its livelier faster ride and outstanding fit. If long long slow miles were my usual I might change my mind and go for the extra cushion and support of the Grasse Road. Despite a complex stretch knit upper with plastic cage the lightFoam midsole of the ULTK is just so much livelier and more dynamic. 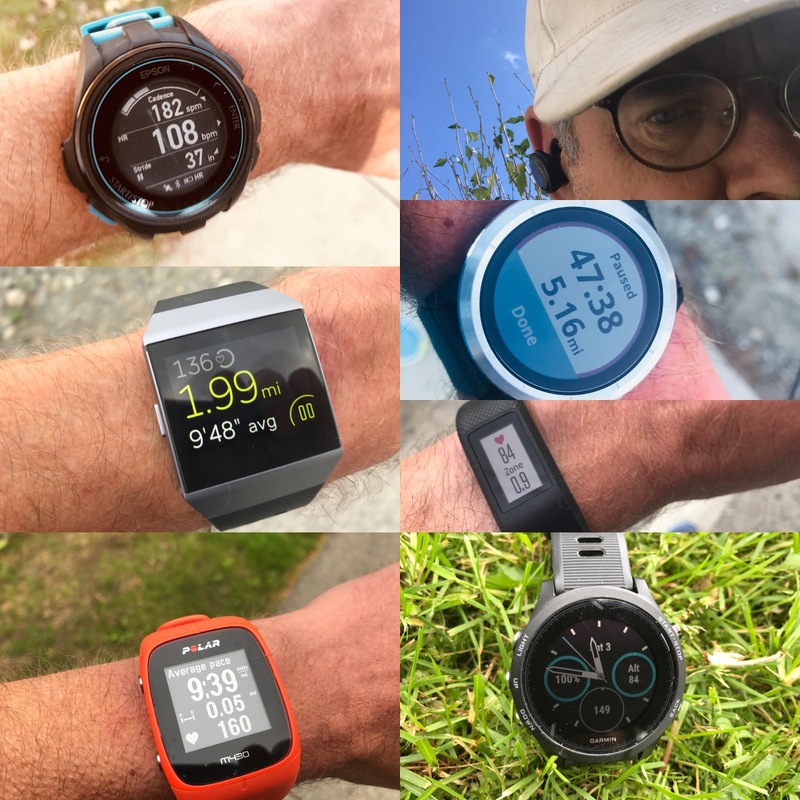 While somewhat less cushioned but bouncier and a touch less stable, the more than half ounce lighter ULTK has a more versatile and superior ride for me. $130. Available now including from the retailers below at prices below retail. The Grasse Road was provided at no cost. The opinions herein are entirely the author's.